H.G. Mathews Mor Antheemos Metropolitan was born to parents Mr. C M Joseph & Mrs. Mary Joseph, Chully Family of Alwaye in 1974. His merits include: 1. Doctorate in Theology (D Th) from the Paris Lodron University, Salzburg, Austria in Patristic Theology – “Integrity of Creation in the Theology of Ephrem the Syrian. A Patristic Eco-theology” – guided by the Head of the Department of Biblical Studies and Ecclesiastical History Univ. Prof. Dr. Dietmar W. Winkler. 2. Certificate in German Language from Ostkirchliches Institut, Regensburg, Germany. 3. BD (Bachelor of Divinty) from The United Theological College, (UTC) Bangalore, Karnataka, India. 4. MA Economics from Mahatma Gandhi University, Kottayam, Kerala, India. 5. BA Economics from Mahatma Gandhi University, Kottayam, Kerala, India. 6. Matriculation from Vidyadhi Raja Vidya Bhavan Higher Secondary School, Aluva, Kerala, India. Mor Antheemos was ordained a Ramban by Catholicos H.B. Baselios Thomas I on 27 December 2011 and ordained as a Metropolitan by His Holiness Ignatius Zakka-I Iwas on 15 January 2012. Current Responsibilities - 1. Patriarchal Vicar and Metropolitan of Malankara Syrian Orthodox Churches in U.K. and Ireland 2. 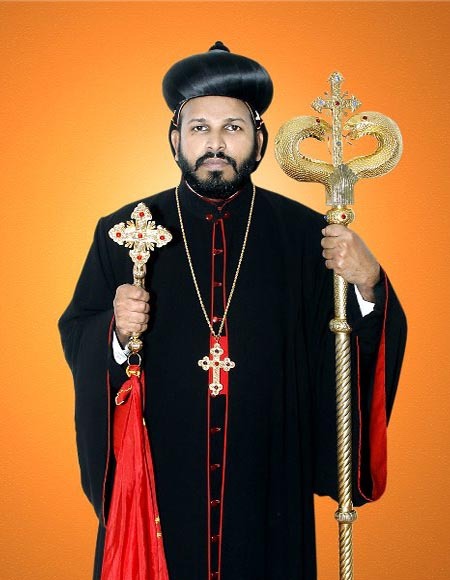 Metropolitan of Muvattupuzha region of Angamali diocese.